Apples and nut butter are a classic combination that make a healthy and delicious snack. Fresh fruit and nuts can also help lower your blood pressure. Fruit provides fiber and potassium while nuts and nut butters offer healthy fats and protein. Up your snacking game with these apple rings dressed up with almond butter and healthy toppings. 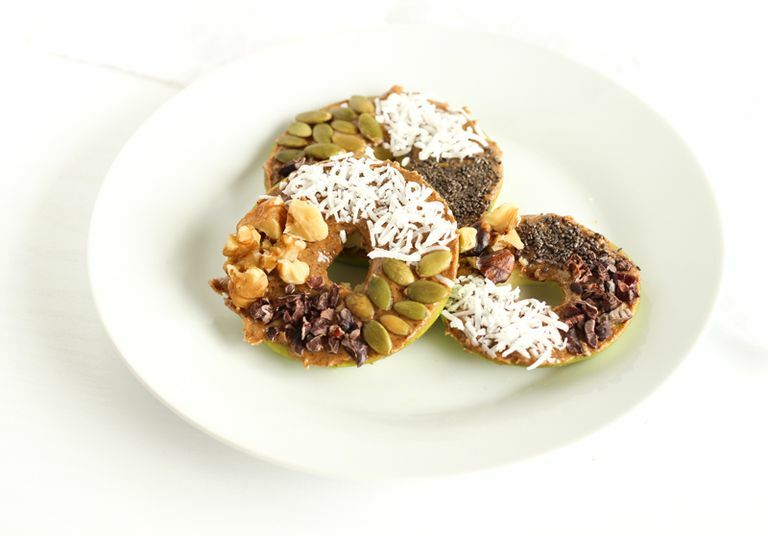 Apple rings, sometimes called “apple donuts,” are fun for both kids and adults when spread with almond butter and sprinkled with healthy nuts, seeds, and cacao nibs. If you’re making these for kids, you can let them choose their toppings and sprinkle them on. Walnuts, pepitas, and chia seeds are all good sources of healthy fats and protein, while the coconut and cacao nibs add a little sweetness. If you don’t have cacao nibs, you can use mini chocolate chips instead. Cut apple in half horizontally. Use a paring knife or coring tool to carefully remove the core of the apple. Slice apple vertically into 1/2 inch slices. Spread each apple slice with almond butter. Top apple slices with walnuts, chia seeds, coconut, pepitas, and/or caco nibs. Use any nut butter you’d like, but make sure it doesn’t have added sugars. Peanut butter and cashew butter are popular alternatives. Read the ingredients label to learn about the ingredients that go into your product—the fewer the better! You can also get creative with the toppings. No need to use walnuts, chia seeds, or the other listed ingredients if you don't like them. Especially with children, let them get creative and choose something they like.